In the past, when reading in God’s word that we were required to be an honest person, many brothers and sisters thought that it was not hard to be an honest person and that as long as one told the truth without cheating others in everything, he was an honest person. Most people did not meditate or seek whether they had lived up to the standards of an honest person, and even less did they pay attention to entering into being an honest person. Thus, the matter of practicing being an honest person was shelved. Recently, through the man’s fellowship “The Four Indices People Have to Grasp in Pursuing the Truth to Gain the Transformation of Their Disposition,” we have clearly realized the importance and crucialness of being an honest person, knowing that being an honest person is the prerequisite and the foundation for the transformation of our disposition and is the start of pursuing the transformation of our disposition. Because God likes honest people and loathes crafty people, only if we begin by practicing and entering into being an honest person will we be able to establish a normal relationship with God, and will we easily communicate with God and receive the working of the Holy Spirit. If we have no entering in in being an honest person, we cannot have transformation of our disposition, even less can we be saved and perfected by God. Thereafter, most brothers and sisters have a sense of urgency about being an honest person and are willing to enter into the truth concerning it. Then, how should we pursue to be an honest person? In the man’s fellowship, it says: “God likes honest people and hates crafty people, because God is faithful and the devil is a liar. People, after being corrupted by satan, have all become ones who are full of lies. Corrupt human beings lie about everything, and even every word of theirs is mixed with a lie. They have all become experts in telling lies and master-hands in making up lies. Of the words corrupt human beings speak, it is very difficult to judge which is true and which is false. No corrupt human being is trustworthy. … To be an honest person is to speak true words, do practical things, tell no lies, and not sophisticate, and is to be faithful to God in performing duty, not cheat God, and prefer to bear humiliation rather than tell a lie. The standards of an honest person are these: no lie being found in his mouth, performing his duty without perfunctoriness or slipshodness, having no words or behavior of cheating God, being able to be absolutely faithful and obedient to God, and worshiping only God and not satan. Only such a person can be called an honest person.” This passage has shown us the accurate ways to practice being an honest person and the standards for being an honest person. But because some brothers and sisters are limited in life entering in and understanding ability, they only understand the literal meaning of the ways fellowshipped about by the above, and when practicing, they can only observe regulations and are still unclear about the specific ways of practice. In light of such a state, I will talk about my little knowledge and understanding about these words. I hope it will be of some help to brothers and sisters. From this fellowship we see that, on the whole, we can practice and enter into being an honest person from the following three aspects: First, we must have a knowledge of God’s substance of being faithful and almighty and searching everything; second, we must also know the degree of our being corrupted by satan and our various corrupt states, and truly see that we lie too much and cheat too much, falling far short of the standards of an honest person that are required by God; third, we must also know the specific states of “speaking true words, doing practical things, being absolutely faithful to God, and having no behavior of cheating God,” as described in the fellowship from the above. After we know these, we should exercise to enter in from these aspects. By practicing being an honest person in this way, we will easily achieve the results. To be an honest person, first of all, we must have a knowledge of God’s disposition and God’s substance, and know that God likes honest people and hates crafty people, and at the same time, we must have a knowledge of God’s almightiness, God’s searching everything, and God’s ruling over everything, and believe that our everyday conduct and actions are all in the eyes of Almighty God and under his searching. If we have no knowledge of these several aspects of God’s substance, it is very difficult for us to practice being an honest person. In the past, many people failed in their belief in God because they had no knowledge of God’s substance of being faithful and God’s searching everything. They did not accept God’s searching in their doing things and acted one way to others’ faces and another behind their backs, always playing craftiness and practicing deceit, and finally were revealed and eliminated by God. Actually, in our real life, because we have no knowledge of God and do not believe that God searches everything in secret, we also often tell lies and create false appearances before others. For example, when some people hear their leader say in the meetings that the expressions of those who do not pursue the truth are that they never ask questions and do not spend effort on the truth, they then casually ask a couple of questions to deal with their leader for fear that the leader may say they are not pursuers of the truth. Some people are in a bad state for a period of time and are reluctant to read God’s word, but for fear that the brothers and sisters around them may say that they do not thirst for God’s word, they hold the book of God’s word in their hands and pretend to read it, without seeking fellowship to resolve their wrong state. In order to prove before the brothers and sisters that they are seeking and have burdens for the work, some people, even though they have no more words to say in their personal prayer, intentionally kneel a while longer or say some superficial words to prolong their prayer, creating a false appearance to delude others into thinking highly of them. At the co-workers’ meetings, some people, when finding nothing worthy to note down but seeing others taking notes, practice affectation and continue to make marks in their notebooks for fear that their leader or co-workers may have a bad opinion of them. From these, we see that if we have no knowledge of God’s substance of being almighty and searching everything, we will create a lot of false appearances and have many hypocritical practices. Such expressions of lying and cheating are too many in our daily life. If we do not resolve these wrong states soon, once our reputation, position, future, and destiny are affected, we will cheat God directly. Therefore, believing God’s searching everything and knowing God’s substance of being faithful are the start of practicing being an honest person. If we have no entering in in these truths and have not undergone God’s discipline and revealing, we cannot possibly achieve good results in practicing being an honest person, and we will only end in failure. To be an honest person, we must also exercise to speak true words and do practical things, and be faithful to God and not cheat God. In the man’s fellowship, it says: “To be an honest person is to speak true words, do practical things, tell no lies, and not sophisticate, and is to be faithful to God in performing duty, not cheat God, and prefer to bear humiliation rather than tell a lie.” After reading these words, many people consider it very simple to exercise to speak true words and do practical things. But the fact is not so. Before we, who have been corrupted by satan, gain the truth, it is very difficult for us to say a true word. As long as we examine carefully, we will discover that in our speaking there are too many perfunctory and evasive words, too many flattering and complimentary words, too many hypocritical and deceptive words, too many words that are contrary to the facts and inaccurate words, and too many words that cannot stand the test of verification and words that cannot be fulfilled. So, to exercise to speak honest words and accurate words, firstly, we have to exercise to speak our mind and tell the truth, that is, to express truthfully what we think in our mind, attaining consistency between our words and our thoughts, and never speak contrary to our thoughts or be double-tongued. Secondly, we have to exercise to have a right intent in speaking, without crookedness and craftiness in it. As long as our intent is right, we will not speak in a roundabout way or exaggerate. Besides, we have to exercise to view things and speak in light of God’s word. This is the most crucial practice, for God’s word is the truth and the actual fact. So, no matter what happens, we should exercise to view it and speak in light of God’s word rather than speak according to our mental imaginations, feelings, and inferences, and exercise to “let our ‘Yes’ be yes and our ‘No’ be no,” so as to speak accurately and finally reach the point where no lie will be found at any time in any of the words that we have said. This is the entering in we should have in speaking honest words when practicing being an honest person. In the above paragraphs, we have fellowshipped about the three ways of practice in pursuing to be an honest person, namely, knowing God’s disposition, God’s substance, and God’s almightiness, knowing the degree of our corruption and our various corrupt states, and practicing and entering into speaking true words and doing practical things. 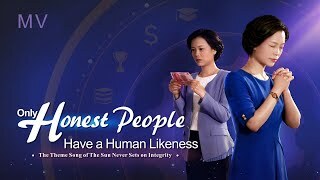 Although it is not easy to practice being an honest person, and it is not a matter of a single day and requires us to pay a great price and make unremitting efforts, nevertheless, if we succeed in it, we will be right people in God’s eyes and will stand a good chance of gaining the transformation of our disposition and being saved by God. Hence, it is very important and significant to practice being an honest person. May brothers and sisters all practice being an honest person properly and perseveringly until you achieve success. Because my experience and knowledge of the truth are limited, I cannot possibly talk quite clearly about the truth of being an honest person fellowshipped about by the above. I can only fellowship about my shallow knowledge with brothers and sisters to share it. I hope it will render some help to the brothers and sisters who pursue to be an honest person but who are not clear about the ways of practice.